Charley Berryhill of Ramblin' Records & Vintage will offer about 5,000 records Saturday at The Bartlett for Record Store Day. Other Cheney third graders didn't listen to Elvis — not in the early '90s, anyway. So when Charley Berryhill's Mississippi aunt sent him a tape of the King, he told his parents "no thanks." Later, lured into the living room by the tantalizing sounds of "Jailhouse Rock" playing on his dad's stereo, he realized his error. "It was great, it was infectious," recalls Berryhill, now 34. The vinyl enthusiast hasn't let his peers dictate his musical tastes since. He listens to what he likes (a lot of old-school hip-hop, R&B and funk) and says others should too. While he's consigned records at various local shops for a few years, two months ago Berryhill started his own business, Ramblin' Records & Vintage. This weekend he'll offer his first pop-up shop at the Bartlett, coinciding with Record Store Day (although he's not an official participant and won't offer the RSD merchandise). With about 1,000 records in his personal collection, Berryhill says he'll have nearly 5,000 records for sale at the event, including everything from the obscure to the obvious, like the albums of artists from his childhood — the Eagles, Styx, and of course, Elvis. A brick-and-mortar space seems confining, he says. There's too much overhead, and you're expected to be there daily. Instead, he buys whole vinyl collections from folks on Craigslist and hits up estate and garage sales. "The best part of this is the digging, the thrill of the hunt, the getting dirty for a little bit to find the best records," he says. Soon, the South Hill resident will take to the road to mine the vinyl collections of other Americans. Once the weather turns cold later this year — he's outside as much as possible during the summer — Berryhill plans to travel the U.S. in a van he hasn't yet purchased. He'll wind down the West Coast and snake through the lower part of the country until he hits the Atlantic Ocean, along the way buying and selling records. 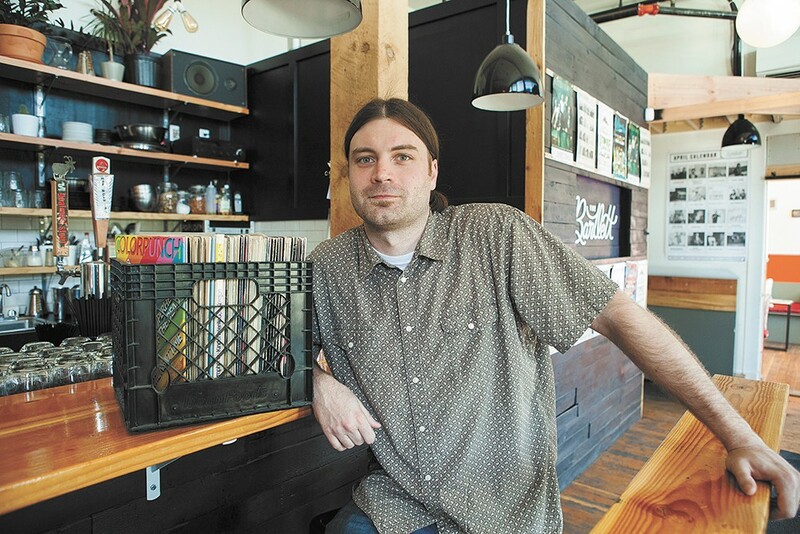 He wants to find albums you can't find on Spotify or iTunes or anywhere else, and bring them back to Spokane. His job at a group home for at-risk youth allows him the flexibility. Berryhill is quick to say that records are cool right now. Like many other Americans his age, he started collecting about 10 years ago, around the same time that vinyl sales began to grow steadily. According to Nielsen's 2015 U.S. Music Year-End Report, record sales have risen another whopping 30 percent over the past year, with nearly 12 million units moved. What's even more thrilling is that vinyl is keeping independent record stores in business, with 45 percent of all sales occurring at small brick-and-mortar shops, not online. For nine years, Record Store Day has helped guide this trend, bringing big lines. "There's a novelty here; this was my generation's first format," says Berryhill, who also DJs around town. "Album covers and band names are interesting, and that's what it is. It's the tangible aspect of it. MP3s you can't touch and feel. You don't just hand people your phone to look through your collection; instead, it's a conversation piece that people can identify you with." Once back from his travels — an annual expedition, he hopes — Berryhill plans to continue expanding his pop-up shop business. He says he doesn't want to be an everyday competitor to the record stores already established. Prepare for Saturday by checking out recordstoreday.com for the full list of RSD 2016 exclusives. Currently, not all local record stores know which limited-edition albums they'll receive. Call for more info. 4,000 Holes, 1610 N. Monroe, 325-1914: Opening at 8 am, free RSD swag available and an exclusive special edition poster. Live music by Danny and the Sugarmakers and James Fry, along with comedy from Ken McComb, starts at 3 pm. Garageland, 230 W. Riverside, 315-8324: Opening early at 7 am, with an in-store record signing by the Thermals (later playing the Bartlett) in the afternoon. Live DJ spins '80s music at 8 pm. Groove Merchants, 905 W. Garland, 328-2327: Although not officially part of RSD, expect a large vintage record sale with live music throughout the day. The store opens at 9 am. The Long Ear, 1620 N. Government Way, Coeur d'Alene, 208-765-3472: Opening at 10 am, the recently moved spot plans to release a bunch of used vinyl gems they've saved specifically for the day, along with the RSD selections. Manito Tap House, 3011 S. Grand, 279-2671: From 11 am to 3 pm, bring in your records to be played in-house. Sip Dogfish Head beer and enter to win a record player (winner announced at 3 pm). No records are for sale. Recorded Memories, 1902 N. Hamilton, 483-4753: Opening by 11 am; as long as weather holds, there'll be an outdoor sale. Official RSD posters are available.